This entry was posted in Hurling, Media Reports, National League, Waterford and tagged Galway on 20/03/2016 by deiseach. Derek McGrath knows what it is to be part of a squad that is brewing up a storm, and yet not be part of the team. 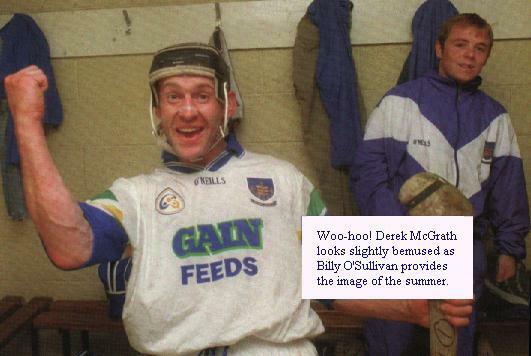 The image above, originally from the Indo with a bit of Come on the Déise editorialising to conceal that, shows Billy O’Sullivan revelling in the win over Tipperary in the 1998 Championship. Derek would only make one substitute appearance in the blowout win over Galway later on that year to add to a substitute appearance in the blowout loss to Limerick the previous year. That was the sum total of his Waterford Senior summer career. More than almost all of us, but an awful lot of sitting around and an awful lot of tedious training sessions for so very little. It was after that Tipp win that I read/heard Stephen Frampton, last seen at the game last week against Dublin, saying that he never minded the hidings. It was training for the hidings that was exasperating. So it is good to see McGrath give the rest of the squad a run-out tomorrow against Galway. Tipp won’t be too impressed as there is no point pretending that Waterford won’t be weakened by this. If the players were better than what currently have, surely they would have been playing before now. From Waterford’s perspective there is little downside though. We can’t guarantee finishing first in the division with a win – Dublin beat Kilkenny and they finish ahead of us on the head-to-head. And we can’t finish worse than third – Galway and Tipp can’t get more than five points. Wexford look the most likely opponents in the quarter-finals should we top the group, which is definitely an away game, while there would be a 50:50 chance of a home tie should Clare lose to Limerick. Sure, Clare are better than Wexford, but it would be a more interesting clash. Either way, there isn’t a crucial need to win. And who knows? Someone might brew up a storm and we’ll be wondering how we ever coped without them. This entry was posted in Hurling, National League, Waterford and tagged Derek McGrath, Galway on 19/03/2016 by deiseach. Of course, we can’t really judge this pitch until Australia have batted on it. Armed with such knowledge, I decided it might be an idea to wait until after the second All-Ireland semi-final between Tipperary and Galway before posting my thought on our game against Kilkenny. That’s my story as to why it’s so late and I’m sticking by it. The first thing to note about the respective games is the wisdom of crowds. I waited until Saturday evening before buying my tickets in SuperValu and the chap there was all apologetic about the quality of the tickets. I was not all bothered – where are these awful seats in Croke Park? – and I was quite pleased at the thought that this might be approaching a sell-out. Arriving in Dublin, it was even more encouraging to encounter traffic jams just past Kilcullen and see signs advising us to avoid the Red Cow park-and-ride. This was going to be a blockbuster! So a crowd of 41,122 was rather disappointing and the contrast with the 58,495 punters at the second semi-final was stark. We did outnumber the Kilkenny attendance but that only went to show how they were confidently keeping their powder dry for a bigger battle. The supporters of Tipperary and Galway obviously felt their game was a toss-up and when even the notoriously travel-shy Tribesmen (for hurling anyway, the big ball game being the pursuit of choice on Corribside) are turning out in such numbers in the aftermath of the trashing they handed out to Cork, you knew something big was in the offing. And what of The System? Everything was building up to this, and if the measure of its effectiveness was the ability to end a run of seven straight defeats against Kilkenny then – spoiler alert! – it was found wanting. That was certainly how I felt after our game, but after watching Séamus Callanan make hay against Galway, I’m not so sure. The sweeper meant there was no such cutting loose from him against us, and while in practical terms that only amounted to four points (3-16 v 0-21) a more potent attack such as Galway possess could have run away from Tipperary had the sweeper been deployed. If that sounds a little dismissive of Galway again, rest assured that it is not. It took some cojones to recover from the sledgehammer blows of those goals, and it is a compliment to their performance that they were able to overcome the tactical deficit and come out on top. At the end of the first half of our game it looked like the system was doing just fine. Our first score, a point from Maurice Shanahan, contained an ever-so-slight hint of a goal chance and while we were ridiculously lucky not to concede a goal shortly afterwards when a few ricochets avoided trickling over the line by hitting the unaware Shane Fives on the heel, there were bodies back there and the harassment of forwards that has characterised so much of our play this year was much in evidence. On the flip side, all that space that Shanahan enjoyed for that first score demonstrated how much space there was in the Kilkenny 45 because, well, only a couple of our players were there. One mazy run by Michael Walsh ran out of steam because there was no one to whom to pass the ball. Austin Gleeson weighed in with his seemingly obligatory score from a sideline, and we were going to need more like that if we were to prosper. It was telling that by the 15th minute there had been only three scores apiece. There was never any danger of anyone cutting loose in the style of Callanan so the first goal was always going to be a proper statement and when a double turn by a Kilkenny player – I really thought those were the kind of thing referees frowned upon in their hopeless quest to spot overcarrying – ended with a ball in to TJ Reid to score a simple goal, you worried it would be a game-changer. With what looked like a one man full-forward line, we were not going to trouble the Kilkenny goal with much. A long-range point from play by Shanahan and a free from him from way out after a stirring catch from Gleeson showed that we had set out a plan to win from the half-back line. When you get in the trenches like that though you are as likely to give away frees as win them and Reid kept things ticking over for them from the place balls. Keep it tight, take your chances. That’s all we could hope for and when Jake Dillon won a cheap free to trim the lead to two and Glesson followed upto make it a one-point game with only three minutes left in the half, you could see the spirits lift around the Waterford crowd. The half ended with flurry of points, Shane Bennett’s point after benefitting from yet more devil-may-care surging from defence from Gleeson being sandwiched by two frees for Kilkenny, one a careless trip from behind and the other a blatant professional foul right on the stroke of half-time to keep the gap at two. The hope was there, it really was. Keep it tight, take your chances. If we were two points adrift with a minute to go, who knows? There was moment for some levity for a Tramore man like myself as the announcer mention the presence on the children’s half-time game of someone from “Fenor NS, Tramore”. Them’s fighting words in the Big Apple Pip. But we’d all be in it together come the first Sunday in September, right? Alas, no. Midway through the first half Jamie Barron (I think it was) was penalised as he cut across a Kilkenny player as they chased a loose ball. I was instantly annoyed by this and the man beside me, who I got the feeling was not from Waterford but cheering for them in the company of his Déise wife, gave me a gentle smile and opined that it was indeed a free. I sheepishly admitted that he was right but I explained that a season of seeing Waterford players consistently emerge with the ball in those kind of situations had made me feel like they would always win them and some manner of skulduggery must have been afoot. It’s all very well saying we needed to keep it tight, but it’s hard to do when the opposition are so much more robust than you are. A combination of physical conditions and the elixir that is Brian Cody means some of these Kilkenny lads are hewn from granite and as the metres covered and hits taken piled up, it began to tell. Even taking all that after-the-fact comment into account, the game was nearly up moments in to the second half as Walter Walsh found himself in acres of space but fired his shot across the bows of Stephen O’Keeffe’s goal. Kilkenny tacked on two scores practically from the next two puckouts, and while a cheap free for Shanahan and a well-worked score down the line from Tadhg de Búrca to Kevin Moran kept the gap at two the cracks were beginning to appear. Barry Coughlan had time to clear after de Búrca engaged in his normal mopping-up operation only to hit it straight to a Kilkenny forward who lashed it over, and when even de Búrca couldn’t engage in his normal moping-up operation, finding himself stranded with no support and giving up the free, the alarm bells were well and truly ringing. We knew that to win this everything had to go right, but how can you get it right when they are in your face so often and showing they had so much more water in the well from which to draw? There was a sniff of a goal chance for Colin Dunford as he cut across the face of the Kilkenny full-back line, and you might wonder whether recent travails in the shooting department made him reluctant to take it on as he took his point. The neutral-ish chap to my left certainly thought this was a chance spurned. Given the iron will so repeatedly demonstrated by Kilkenny under Cody, the game was curiously ragged and when Richie Hogan hit a wide from out near the 45 that he would literally, in the truest sense of the term, have expected him to put over with his eyes closed, you could see a little vulnerability there, if only we could take it. Galway will certainly be hoping they saw exactly that. We were out on our feet already though. It was painful watching Jake Dillon to wring some more out of his linen, and a push on the back from Austin Gleeson showed tired minds as well as limbs. Most of Waterford’s efforts were hit-and-hope balls into the mix. You wanted to scream at them to move the ball in the manner in which they had being doing in previous games, but the flesh was weak. Another half-chance for a goal from Dunford led to a point and kept the gap at three and is probably the point at which ingénues like my wife and her family/friends would be able to tell me afterwards that we had gone soooo close, but from where I was sitting it would need a red card or a fluky goal to keep us in touch. Instead we got a couple of nervous/exhausted flails from Jamie Barron on which Kilkenny pounced to swiftly stretch the lead back to five. I’m not saying Waterford gave up. They tried, Lord did they try. Austin Gleeson sent off over a tremendous solo effort from way out and they were still capable of putting up one of those splendid phalanxes across the goal which has served them so well this year. It all felt like it was from memory though, and the gaps appeared again to the extent that Ger Aylward only had to round Stephen O’Keeffe to put the game to bed. He went around him and incredibly somehow put it wide at the near post. It was an appalling miss, followed by two more desperate wides from play for them. One of them was from Richie Hogan and it’s hard to believe he has hit two as bad as as he hit in this game in an entire year in his career before now. Dunford, so effervescent in the third quarter, was now back into the business of wides and Kilkenny were content to play scrappy, burning through a couple of minutes with throw balls and relying on Hogan not being completely off his game with a couple of points from play, both far more difficult than those he had missed. The second saw him leave two Waterford players in his wake. A depressing sight. As the team who served so much classic fare in the Noughties with our freewheeling style of hurling, I’ll say that I don’t miss it that much, even after watching the thrill-a-minute stuff of the second semi-final a week later. Those games where the lead see-saws constantly and the spoils go to those who happen to be leading when the ref blows the final whistle are wonderful for the neutral but ghastly for those involved, even when you win. Then again, this was pretty ghastly fare at the other end of the spectrum, the only consolation being that it could have been much worse as Kilkenny failed to get our jugular. A few more bodies went into the forwards to try and get those goals but they never looked like coming. About as much satisfaction as we got was seeing sub John Power stick his arse into Stephen O’Keeffe as he came to clear a ball. Hey, at least we didn’t resort to that kind of nonsense in defeat, right? After the game, everyone I spoke to seemed profoundly depressed. My father thought it was the worst effort at getting over the semi-final hump he had seen from Waterford. On the Luas I encountered a former work colleague, the type who works diligently for his club and attends loadsa games, so for as robust and knowledgable a supporter as him to be so maudlin was a sign that this had not been a good day at the office. Looking back on it, it wasn’t great. The incoherence of my writing above about the second half mostly reflects the incoherence of my writing, but it was a disjointed display from Waterford. Shorn of so many of the members of the hurling pantheon who have graced their team over the last 15 years, Kilkenny are not the force of old. Galway will have seen the sloppiness of their overall display and will be confident they can take on the lessons of the Tipperary game and apply them in the final. Would we be able to do the same if we got a second bite of the cherry? I don’t think we would. They horsed us out of it in the end, and no amount of systemising would have been won that game. Remember where you read that slogan first. I refuse to be downbeat though. At the end of last year I was worried we might be overtaken by Laois. Now, we’re meant to be despondent because we couldn’t overtake Kilkenny? The gap between where we were and where we are is gargantuan, and we even have some silverware to prove it. We weren’t close to the ultimate prize, but I still think it was a year worthy of a cigar. 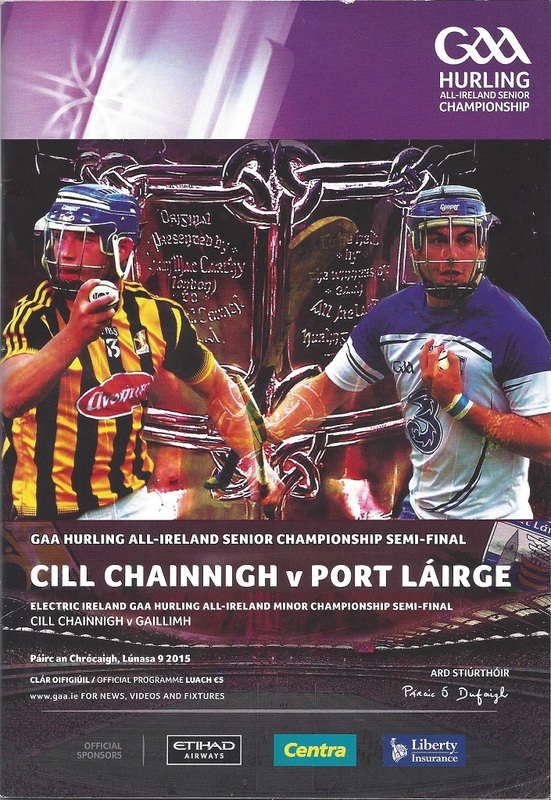 This entry was posted in All-Ireland, Blues Programme, Hurling, Match Reports, Waterford and tagged Croke Park, Galway, Kilkenny, Tipperary on 10/08/2015 by deiseach. I never pretend to have an inside track into what is going on in Waterford hurling. The limit of my contribution to the grassroots of the game is buying a couple of tickets every fortnight for the club lotto, and even then it’s the nice man who comes to my door who does all the hard work. Incidentally, he’s a member of a genuinely famous Tramore soccer family. His heavy involvement in the GAA strikes me as being akin to apostasy and I’m dying to ask him what his story is. But I digress . . .
Knowing nothing about what goes on behind the scenes doesn’t make me incapable of interpreting what is out there in the open, but I’m questioning my ability to even do that now though after Derek McGrath made no fewer than six ‘last-minute’ (as if they were decided upon just before throw-in) changes to the team that had been published to play Galway. I had thought after the swift announcement of the team that he was eschewing the daft (in my opinion) habit of releasing what was effectively a dummy in the mistaken (in my opinion) belief that this might throw the opposition off the scent. I understand there were a few post-Fitzgibbon injury concerns, but six enforced changes seems improbable. The upshot of the weekend just past is that, far from being a straight-as-an-arrow type that I thought he might be, Derek McGrath is just as sneaky as the rest of them. In addition, maybe these mind games are not as ineffective as I thought as Waterford swept to a wonderfully impressive win over a team who had gone nap in the previous round. It’s sobering to find out you know even less than the little you thought you knew. Thank goodness for the wonderfully impressive win to ease the pain, eh? This entry was posted in Hurling, Waterford and tagged Derek McGrath, Galway on 25/02/2014 by deiseach. Derek McGrath made six changes from the team he announced last week, with Iggy O’Regan coming in for Stephen O’Keeffe in goals, Tadhg Bourke for Barry Coughlan at corner back, Ray Barry for Jamie Barron on the right wing, Stephen Molumphy for Jake Dillon on the left, Ryan Donnelly for Maurice Shanahan at corner forward and Seamus Prendergast for Shane Walsh at the edge of the square. On today’s performance, you would wonder if that forward line started last week would be now top of the league. However, the big difference was that Pauric Mahony’s radar from open play was in much better working order, as he finished up with five points from play as well as six pointed frees. In the process he gave Iarla Tannion a torrid time and was my man of the match. Overall, this was a great team performance, with the players hunting in packs and working hard for each other. Playing against the wind in the first half, they worked their way out of defence very well with some good hand and stick passing and support play. However, at times they overdid the short passing and in the second half in particular, with the wind behind them, they might have used route one more often as Seamus Prendergast clearly had the Galway full back in trouble. In the first half, despite having the wind at their backs, Galway were unable to take control of the game as Waterford defended really well and played some excellent ball into the forwards which on another day might have produced a couple of goals. Galway did have eight wides (to Waterford’s four) but, unlike last week when they were scoring for fun, today they were nearly always shooting under pressure. As it happened, Waterford had their own share of wides (five) in the second half and both sides ended up with nine wides apiece. The key features of the first half, apart from Pauric Mahony’s roasting of Iarla Tannion, were Jamie Nagle’s marvellously skillful performance at right half back, a couple of great layoffs by Ryan Donnelly to create scoring chances for Mahony, and some great catches by Seamus Prendergast. The one time he got clean away he was taken down cynically just outside the large square. Overall, the exchanges were even enough, with Waterford going in at half time one point ahead, 0-9 to 0-8. It took Waterford a while to impose themselves on the game in the second half but they gradually opened up a three-point lead which was cancelled out by Galway’s goal. Iggy O’Regan must take a lot of the fault as his attempt at a directed puckout went astray but even then Tadhg Bourke unluckily slipped as he went to cut out the through ball leaving Jason Flynn in the clear to fire home from close range. However, this only served to spur Waterford to renewed efforts and, with Kevin Moran storming into the game at midfield and Ray Barry doing the needful on the scoreboard, Waterford controlled the game from there on in to finish comfortably ahead, despite missing some late chances. Waterford also appeared to lose their shape for a while as McGrath sent in several substitutes, including Eddie Barrett for Shane O’Sullivan, Jamie Barron for Brian O’Sullivan, Jake Dillon for Stephen Molumphy, Stephen Roche for Seamus Prendergast and Gavin O’Brien for Ray Barry. It has to be said that all the substitutes settled in right away and none of them looked out of place. The Waterford defence was again massive today. Tadhg Bourke deserves great credit for an excellent performance in his first senior start for the county. He played with great poise and maturity, allied to a good brain and super skills, and didn’t allow the slip-up for Galway’s goal upset him. Of course, it was a big help that the other full backs, Shane Fives and Noel Connors, were both in top form, with the latter giving a master class of corner back play in the second half. Apart from Jamie Nagle, Brick Walsh owned the centre back position and destroyed his opposite number (who was substituted) while on the other wing Philip Mahony also did the business. Shane O’Sullivan worked hard all through at midfield, while Kevin Moran really led the charge when Waterford took over in the final quarter. Ray Barry had a quiet enough first half but really impacted on the game after the change of ends to finish with four points while Stephen Molumphy, as ever, was extremely effective on the other wing. Ryan Donnelly really impressed here, once he got up to the pace of the game in what was also his first start. He has great pace and body strength, and the ability to look around for players in better positions. Seamus Prendergast also had a really good game, but Brian O’Sullivan again had little impact. When one thinks of the following list of players who didn’t play today, with most of them hopefully becoming available as the year progresses, one can see that these really are potentially exciting times for Waterford hurling. Stephen O’Keeffe, Barry Coughlan, Liam Lawlor, Paudie Prendergast, Stephen Daniels, Darragh Fives, Richie Foley, Maurice Shanahan, Shane Walsh, Brian O’Halloran, Donie Breathnach and perhaps Stephen Bennett, Austin Gleeson and (hopefully) DJ Foran. Galway scorers: Conor Cooney (0-6, two frees), Cathal Mannion (0-3), Jason Flynn (1-0), Padraigh Brehony (0-2), David Burke and Niall Healy (0-1 each). This entry was posted in Hurling, Match Reports, National League, Waterford and tagged Galway on 25/02/2014 by deiseach. After much to-ing and fro-ing, the League format is settled for 2014. The provisional fixtures are out and using the magic of the intrawebs we’ll be able to update them as more information emerges (translation: at the time of writing, apart from the opening game under lights in Thurles, I’m guessing about the venues). This entry was posted in Hurling, National League, Waterford and tagged Clare, Dublin, Galway, Kilkenny, Tipperary on 20/11/2013 by deiseach.